A full biography of Father Wathen and his life is presently being put together, however, until this work is finished, we will offer this short description and history of Father’s life. Father Wathen was a well known Catholic writer and historian. Father was born in Reed, Kentucky in 1932, the fifth child (of ten) of Samuel Spalding Wathen and Margaret Richardson Wathen. Father’s ancestors, the Spaldings, Lancasters and Wathens, were among the Catholic families who established the colony of Maryland in 1634. Their descendants migrated to Kentucky in the 1700’s and settled mainly in what later became Nelson, Marion, and Larue Counties, which among themselves they ever afterward referred to as “the little Holy Land.” These people produced large families, and gave many children to the Church as priests, brothers, and sisters, who, in their turn, made a very significant contribution to the development of the Church throughout the Midwest and western United States. Archbishop Martin John Spalding was the second bishop of Louisville before becoming Archbishop of Baltimore (1864-1872.) First educated in a log school, he entered St. Mary’s College at the age of eleven and became its professor of mathematics at the age of fourteen. Subsequently educated in Rome, and president of St. Joseph’s College at the age of twenty-eight, he was a zealous priest, outstanding administrator, theologian and scholar, whose amazing accomplishments would fill a book. He helped establish the American College at Louvain, and was a leading proponent for a North American College in Rome and for an American Catholic University. He presided over the Second Plenary Council of Baltimore in 1866, and participated in the First Vatican Council in 1870, where he strongly supported the definition of papal infallibility. His dissertations, both written and spoken, were outstanding, for example his explanation and justification of the famous Syllabus of Errors of Pope Pius IX. Archbishop John Lancaster Spalding was the first bishop of Peoria (1876-1908). In only 7 years he constructed 84 churches, 49 schools, 5 hospitals and an orphanage; while encouraging and sponsoring Catholic colonization elsewhere across the developing West. In addition, he labored assiduously for the establishment of Catholic University of America, with the result that the Third Plenary Council of Baltimore adopted his plans for this institution in 1884. From such heritage came the author. His grade school education was obtained at St. Francis Academy where he was taught by the Sisters of Charity of Nazareth, Kentucky. Sensing his vocation at an early age, he entered the Minor Seminary at St. Charles College in Catonsville, Maryland where he was taught by the Sulpician Fathers from 1946 to 1952. He then progressed to the Major Seminary at St. Mary’s University in Baltimore, the oldest and most prestigious Catholic Seminary in America. There he studied under the Sulpicians from 1952-1954, receiving a B.A. in Philosophy. He completed his priestly education under the Benedictines from 1954-1958 at St. Maur’s Priory and Seminary in his home diocese in Kentucky. 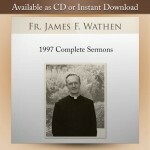 Father Wathen was ordained on May 3, 1958 by Bishop Francis R. Cotton of Owensboro. Father Wathen’s diocesan appointments included that of assistant pastor and high school teacher, 1958-1965; Pastor of Rosary Chapel, Paducah, Kentucky and St. Mary’s Church, La Center, Kentucky, 1965-1967; Pastor of St. Joseph’s Church, Central City, Kentucky, and St. Charles’ Mission, Livermore, Kentucky, 1967-1970. In 1970, at his own request, Father was granted a leave of absence by Bishop Henry Soennecker. His mission was to serve as the spiritual director for a soon to be founded religious community devoted to perpetual adoration of the Blessed Sacrament. When this effort was aborted by the diocese of Corpus Christi Texas, Father Wathen proceeded to work as chaplain for the Sovereign Order of St. John, which he had joined in 1969, before he left the Owensboro diocese. Father Wathen prides himself on two things only: his effort to adhere strictly to the traditional Catholic Faith, and his never having said the Novus Ordo Missae, the so-called “New Mass” of the Roman Rite. His work as a “Traditionalist” priest has resulted in being the author of 4 books. In 1972, he authored one of the first critiques of the Novus Ordo Missae (the New Order of the Mass), which was introduced in 1969 in the wake of Vatican Council II. The new liturgy had been established to try to supplant the historic, valid, orthodox, Latin Mass. 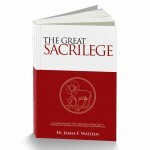 The book, which he is best known for, titled The Great Sacrilege is an analysis of the New Mass in terms of its morality. More than 40,000 copies have been sold. While many books and hundreds of theses have since been published on this subject, Father Wathen’s book remains the classic work. In 1970 he wrote The Words of Christ. This book was written to encourage everyone to resort to the Scriptures as the ideal book of devotion, instruction, and moral guidance. In 1994, he completed his monumental work called: Who Shall Ascend? This magnificent 689 page scholarly work sets forth in unique clarity the doctrine of the Catholic Church, in particular, the Doctrine of Exclusive Salvation, i.e, what men must do to be saved and gain everlasting life. In addition, the book is a treatise on the Second Vatican Council (1962-1965) and the “Conciliar” or “New Age” Church to which it gave birth. Every Catholic should read this book! This was to be Father’s last work due to contracting Chronic Lymphocytic Leukemia, which ironically he had also suffered from cancer at a very early age, but miraculously surviving, which we feel was because God had a great work in store for Father to defend the true faith and the True Mass. His whole life was a sort of battle on many fronts, not least his poor health. He succumbed to the cancer after a heroic battle at the age of 74. On this website there is a link titled: “Father’s Updates.” These are not only a touching record of what Father endured through his battle with cancer but on most of the entries, you will find extremely valuable mini-sermons where Father’s strong faith shines through despite his sufferings. May he Rest In Peace and may his and all the souls of the faithful departed, Rest in Peace, Amen.